Dear cardealpage thanks very much . I drove it all the way from Dar Es Salaam to zambia it runs great and I enjoyed driving it. We truly appreciate doing business with you , and we're grateful for the trust you've placed in us. Please don't hesitate to contact us if you have another inquiry . Good day all. I received the car all in good shape/condition and family are happy too. Thanking you for the support and communication updates you provided from the time I purchased the unit up to the day I received. I can;t hesitate to sell your name to the would be next buyers from you reputable company. Please continue with the same spirit you have towards your clients. See attached picture for my happy school kids. Thank you for visiting us and making your first purchase! We’re glad that you found what you were looking for. It is our goal that you are always happy with what you bought from us. We are looking forward to see you again. Have a great day! Yes, I have received my vehicle, thanks for the good service. We are very glad that you love and enjoying your car. We had good time dealing with and we expect you to join us again very soon. I wish to commend CardealPage for the excellent & exceptional service rendered to me during the purchase of my vehicle. I received the Mercedes C200 and all I can say is that I have never been disappointed with the cars you sell. They are always neat, clean and well maintained. This particular car sold to me has a very good engine, interior & exterior even better than the first one I purchased from you. Thank you very much for doing business with us. We really appreciated having good busines relationship with you one more time. We hope you will enjoy your vehicle. Always you're welcome to cardealpage. I can now confirm receipt of the car. thank you very much for the photos . We are looking forward to have more business with you. I wish to acknowledge the receipt of Mitsubishi canter which is in good shape and functioning effectively. I cannot hide my joy for the unit but to commend you for the good quality of your stock. I received my vehicle in excellent condition and would like to thank cardealpage management for the smooth and quickest transaction ever made. Willing to buy from you when time arise and recommend others to but from you. We are very happy to see you smiling. Nous serons tres heureux de vous recevoir de nouveau. Yes i received the Vehicle safely . The vehicle is working fine here in Lusaka. Find attached a photo. Good morning. Thank you for your kind feedback with photo (your daughter is lovely, by the way). It was our pleasure to provide our service to you. Hope this Dyna truck will stay healthy and give you its best service. Let's keep in touch and we are looking forward to working with you again. Hi Thida, thank u. so much for the cooperation & support.U so kind & da entire Cardealpage is awesome. I received my Rosa Bus in good shape & condition & had a vry safe trip back home here in Zambia from Dar. Thanks again & looking forward to doing business with you guyz soonest. How are you? It was so nice to wake up Sunday morning with your beautiful photo and kind messages. Thank you very much. I would love to see this Rosa running on the roads of Zambia. Hope it will give a good service for a long run. Mr K M collects his vehicle with smiles. Customer satisfaction!! We are very happy if you get satisfaction with our carbolated service with Zampost. It's all smiles as Mr C L collects his vehicle. Thank you Cardealpage and thank you Zampost. Good Afternoon Tomisho. Am glad to inform you that I received the vehicle safely. It is a nice one I like it very much. Thank you for your effectiveness in making sure that the car reaches me. Though i only received one pair of a sensor (key) . Is it possible to have another created for me. Otherwise thank you once again Tomisho and CarDeal for facilitating everything. Hi Thida, thank you for you good Customer relation and honest with you team from Cardealpage. I received my Toyota sprinter carib in perfect condition. Good morning. This is Thida. Thank you very much for your kind feedback with photo. 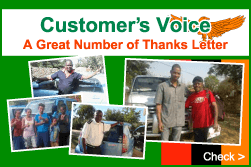 I am ver happy to know that you are pleased with our service and vehicle. It was our pleasure to work with you. Looking forward to work with you again. Dear Thida, my sister I have liked the bus, I want the same type of my bus dear. Thank you very much for your message. We are very glad to know that you are pleased with the bus. It is so cool to see you driving the bus. We will be happy to find another good-conditioned bus for you. Good day Jun, the vehicle arrived safely and all is in order.... it is very nice and clean absolutely amazing. It drives very nice and will check it in the workshop next week after registration is done and give it a full check. But other wise my wife is very happy. Thank you so much for such a very nice car. I can guess how happy your family is from your photos. We do hope that your family enjoy driving for long. Yes it's for my mother I like it very much it's so nice. Thank you for this beautiful vehicle I'll call again. We are very happy to receive photos with your nice smile. We can imagine how excited your mother is! We do hope that your mother enjoys driving for long. Looking forward to having lots of opportunities that we supply cars. Good knew. I am very excited to let you know that I received the RUNX car. It's very neat. We can imagine how excited you are to receive your Corolla Runx. We do hope that yu enjoy driving for long. Je vous remercie beaucoup pour votre achat avec nous. Je suis heureux d'apprendre que vous avez reçu votre voiture en toute sécurité. Je suis sûr qu'il vous servira pendant longtemps. Thank you very much for the car. I have it right now i'm driving . Thank you very much for sharing your update. I am happy to hear that you received the car safely and liked it. Please feel free to contact us anytime if you need further assistance, I will happy to assist you. Today am the happiest man in Zambia.The bus i purchased is indeed a marvel. Thanks to the entire staff especially to Mr Satoshi for the good support you provided from the time i decided to purchase the bus up until i got it from Tanzania. Your professionalism is second to none and you made me feel at peace through out the entire process. Cardealpage surely sell the best second hand cars one can ever desire to have. My money was worth spent and i recommend everyone intending to buy any car to contact cardealpage staff. Thanks once more to Cardealpage team and i promise to purchase all my cars in the near future from your reputabe organization. It's my pleasure to do business with you. looking forward for our future business. Thanks for being efficient ,the condition of the car is of high quality and everything is perfect and excellent. please keep it up with that standard. I am happy to hear that you liked it, am sure it will serve you for long time. Just want to say thank you a lot I received my vehicle in excellent condition. My family is extremely happy and please find the picture attached for me and my Prado. Thank you very much for your continuous purchase with us, and I am happy to hear that you liked it. I am sure it will serve you for long time, hope you and your family will have good time with it. The car safely arrived in Zambia and we are enjoying it as a family. I am very happy with your service and quality. Thank you very much for your e-mail and kind notification. We are very happy to hear that you received your "Dream Car" in good condition. I can see that your son looks very happy with your new car. Let`s keep in touch and continue our good relations. If any of your relative, friend or colleague wants to purchase a good condition car, please direct them to us. The car arrived safely in very good condition. i have liked it. Hi thank you very much for your repeating purchase with us. I am happy to hear that you liked it, and hope the car will serve you for a long time. We look forward to supply you the best condition car again. Your service as a team are excellent. You have customer needs at heart, and that sets CarDealPage the beat in the century. Thank you very much for sending your picture. You looks so happy to get your car and I am sure that your ALLEX will be very useful for your daily life. Thank very much for your good service. I have just received my car today from Zampost. It's intact and clean. I'm so exited and will post my experience soon. We are glad to hear that you received your car with no problem. Please let me know if you or your friends need any other car and need anything from us. I'm very glad to inform you that I have finally received my car. I received it on Monday 14th December though I have taken a bit of some time to contact you, my apologies for that. Inacio let me be very honest with you, my car arrived in a very perfect condition and I could not believe my eyes. What I have is a jewel of a car it's a talk of town by everyone who has seen it. It's such a nice car,so comfortable and good looking. This has even made me think of starting a car business very soon. Please always update me when you have nice cars that are going at good prices like the Crown that I got. This car is so classic. I pledge to recommend you to others who wish to buy cars. I will be sending my photos with my car on Monday 4th January when I get back into office. We are glad to hear that you received your vehicle. Please let me know if you or your friends need any other car. hi Inacio i received my Harrier in good condition exactly the way I browsed it. I like your services and wish all the best in this festive season. I look forward to your continued support of making people's dreams come true. Please let us know if you or your friends need vehicles from Japan. We are very keen to return the gesture by offering you a very good deal once again! We are very happy to hear that you received your Mitsubishi Canter in good condition. We are looking forward to doing business with your again. Thank you for having a good business with you guys. you are a big honest and trusted firm. May you continue with your good customer relationship. I received the ipsum in good condition as advertised. thank you Mr. Inacio for your good Job welldone. I am very happy to hear your words. I am sure the Ipsum you purchased from us will serve you for a long time. Please let us know if you or any of your friends needs a good car. I am looking forward to doing business with your again. You look very happy with your Rosa, and I am also happy to hear that you received the bus in good condition. Hope You Are All Fine. I Wish To Express My Gratitude, Profound Joy And Happiness To Your Company And Hardworking Staff. Indeed, I Received My Dream Car - Nissan X- Trail(2001) On 2nd November 2015 In Very Good Condition. It Has All The Specifications Just As Your Sent In Your Mails During Our Communications. I am Particularly Happy With Your Level Of Honestiness And Quickest In Response. I am Also Happy With Staffs Who Physically Talked To Me On Phone Like Inacio, Jun And One I Have Forgotten. Please Continue Being Trustworthy. I Look Forward To Dealing With You Again In HINO TRUCK (Non Turbo) Next Year. Thank you very much for your feedback, I am very happy to hear that you received your dream car in good condition, we always try to be very honest with our customers because they deserve the know what they are buying. Please contact us again when you are ready to purchase the Hino Truck, our team will be ready again to assist you on your next purchase. I am happy with the services that CardealPage is offering. They have a good variety of very good motor vehicles in excellent condition to choose from with friendly customer support service at their local office in Lusaka. My vehicle arrived scratch free compared to the other vehicle I bought from another dealer few years ago and I was not swindled of any monies. My family is happy that we made the right choice by selecting CardealPage and we will introduce our friends, colleagues and family members to them. Thank you very much indeed for your comment and nice pictures. This is Masao Kuwabara of SANWA JAPAN CARS. JP. We are very happy to know your family like the car we shipped! I have shown these pictures to my colleagues and they are so happy to see you in the car that they have serviced. For us, seeing you in the picture really encourage our daily work. This is very important for us because we hardly see the customers face to face while doing business on internet. X-TRAIL is my personal favorite car. One of our staffs has also bought the same NT30 last month and he's also enjoying. As we are handling this model regularly, please contact us any time on any requirements while driving your X-TRAIL. Thank you very much once again and we'll be happy to communicate to you any time again!! I want to confirm that I have finally received the vehicle I bought from you. I personally went to pick it from dar es salam port and I have now finally arrived home. I only had one tire bust 1000 KM before home which I replaced with the spare will and I have since arrived. The vehicle is neat and in excellent conditions but only the tires are not very good. All in all thanks cardeal I am looking forward to doing business with you again. Thank you very much for your photo, is that your son on the photo? He looks very happy with your new car. I hope this Pajero can be very useful for your family. Please let us know if you need anything from us. We`d be very happy to assist you. I am glad to inform you that i have received my car in good condition. I have to confess that this is the first time am doing business with cardealpage co and happy with your services. looking forward to doing more business in near future. i will send you pictures soon. Thank you very much for your photos, I am very pleased to see your photos with your kids and your Corolla. I hope you can enjoy driving your car with your family. Please let me know if you need any other car. Please let know your lusaka branch address in Villa Elizabeth. Thank you very much for your photos and your feedback. I am very happy to hear that you received your Harrier in good condition, looking at your photos the car really looks great. Please visit our office in Lusaka and keep in touch. We´d very happy to assist you again on your next purchase. Kindly find my photo with the Bighorn I bought from Cardeal. Thank you very much for your photo, you look great next to your Bighorn. I hope the Corolla you bought from us last year is still in good condition. Thank you again for being our customer for a long time. I received the car in good condition. Thank you very much, I love the car will call again in July for another purchase. Thank you very much for your photos! Our number one priority is to make sure that our customers are very happy with their vehicles, so we are very pleased to hear that you love your car! With regard to an owner’s manual, we unfortunately don’t have one, but if you could send me some photos from the fuse box, I will see if I can translate it for you. Thank you very much once again for purchasing from us. Please let me know when you next need a vehicle. I will make sure you get another great one! Bravo! We hereby confirm that we have received the Prado you sent us, and we are glad to attach the two photos. Thank you for the service you gave us. We are a satisfied customer on your list. Thank you very much for your beautiful photo! I am very happy to hear that you are satisfied with our service. I hope we can sell more cars to Lesotho with your help! Have a great and safe drive with your Prado. Kindly receive pictures depicting my good friend E K(in pink shirt) and I. Thanks for the best service ever received in my life. CardealPage, you are the best. Keep it up. Thank you very much for your comments and your photos, you and your friend are very elegant. I am sure your Sprinter will serve you for a long time. I hope we can do business again in the future. I got this car today. Thanks goes to Mr. Osada my sales manager. Car is very neat clean engine. The BENZ you bought from us could pass as brand new because it looks so good! We’re thrilled to hear that your customer is very pleased with it. Have a great and safe drive! Today I have received the Vitz. Thank all for a good job. I have received the car which is in excellent condition, i have liked it very much. thanks very much. Thank you very much for your comment and sending us photos of you and your 1998 NISSAN ATLAS. I’m very happy to know that everything is well and your enjoying your vehicle. Thank you once again for purchasing from CardealPage!! I am happy to inform you that i have received my vehicle (toyotaharrier) which is in very good condition. For this i would like to commend you for being so truthful and fulfilling your words. I can promise you that am going to introduce you to many of my friends and family members so that they can buy their cars from your company. Thank you very much for the beautiful photo! The color of the Harrier contrasts beautifully with the surroundings. It's such a beautiful car, and I'm sure your friends are green with envy! Thank you so much once again for the photo. It makes us really happy when we get messages from our customers saying that they're very happy with their vehicles with our services. We hope this is only the beginning of a very strong business relationship. I received the vehicle and I am happy with it. As you requested, I have taken a photo with the vehicle I bought from you. Thank you very much for your beautiful photo. You look great with your Atlas. I am delighted to hear that you are happy with it. Please let me know if ever you need more vehicles. We'd be very happy to offer you more cars. Its good that you received my photos to reaffirm that i got the car as i ordered. Am so overwhelming that you people are still su9portive even after your sale. So far so good I have no problem with car, and over the weekend am testing it on yet another long trip to my home village. I will be getting in touch with you soon on behalf of the company i work with when i finally meet my MD to discuss which type of cars we need to buy. Anything more you want from this end. Thank you so much for sending us your photos, as well as for your very kind words about our service. The work we do in this export industry can be very stressful at times due to the risks and the responsibility of getting everything right. One minor mistake can lead to a huge loss. However, it makes our job feel very much worthwhile when we have satisfied customers like you who are very happy with our vehicle and service. Thank your good services and by helping purchase my desired vehicle. Please let us know if you’re looking for any more vehicles! I would be very happy to see what we can find for you if you could specify what you need. We are always very happy to help your family and friends too if they also need vehicles. If it’s not too much trouble, please could you send us a photo of yourself with the Pajero. We would love to see how you look! Your family look very happy with your Rosa, please send my regards to them. We are delighted that your bus is running in excellent condition. Thank you again, and we look forward to hearing again from you soon. Dear Osada, All i can say is you have my support because you care for your customers as can be evidenced by your frequent communication with the buyer even after you have sent the vehicle you are still concerned as to whether i have received or not, that shows that you care. find attached the photos of me with the NISSAN ATLAS outside my work place. i thank you, it has been good doing business with you. Thank you so much for going to the trouble of sending us your photo. We are always hugely appreciative when our customers take the trouble of preparing pictures for us, and this time is no exception. We would all like to wish you and your family the Merriest Xmas and Happy New Year. Thank you once again, and please come back to us for your next vehicle! We will give you a very good discount! MR KOUDOU THANKS VERY MUCH I HAVE RECEIVED THAT VEHICLE TOYOTA ALLION I BUY FROM YOU IHAVE SEND MY PHOTO. Thank you so much for your wonderful photos. Everyone must be green with envy for having such a beautiful Allion! We really appreciate the troubles you have gone to send us the beautiful photos. Please let me know if there’s anything more we can do for you in return. We would only be too happy to assist in any way possible. Thank you once again, and have a safe and enjoyable drive! I wish to inform you that the school received the bus ordered from your company. The principal and all members of staff are pleased with the condition of the bus. The bus was clean both inside and outside without dents. The engine is in very good condition. It was a worth deal! We have already labelled with the name of the school. Find attached photos of the bus.There is the Principal and myself. Thank you very much for your e-mail and wonderful news about arrival of bus. I am very happy that all school members; starting from principal liked the bus. We are confident that the bus will serve you for a long time without any fail or problem. Thank you very much for your time too. If you can please take 1-2 photos with your school children(pupils) in front of the bus. As many children as possible Brother. That would be very exciting photos. Find attached photos you earlier requested. Thank you once again for the great service as well as the top-notch unit you provided me. The vehicle is running great, and I'm very happy with how everything went. I will definitely come back to you if I need any more vehicles. Thank you so much for the photos. We really appreciate kind customers such as yourself who go to the trouble of sending us beautiful photos of themselves with our car. Please let me know if ever you need more vehicles. We'd be delighted to see what discounts we can offer you. communication is excellent. KEEP IT UP. Thank you so much for your kind words, and also for taking the time to send us your beautiful photos. You look terrific with the car, and I agree that it’s in fantastic condition, but we’re most of all very happy to hear that you’re satisfied with it. Thank you so much for purchasing from us again, and we look forward hearing from you very soon! Kindly find attached photos of above mentioned bus. I write to confirm that as Friends driving school have recieved the bus in good conditions and we hope to purchase our next assignment from your company. Thank you very much for the wonderful photos! I agree the bus looks great, and I’m so happy that it’ll go to good use serving the children at your school. We look forward hearing from you on CardealPage once again! I would like to inform you that I received my car that I bought from your company.thank you once again for being accurate in your information.I hope to do business with you in the near future. Thank you very much for your e-mail and photo. I am very happy to hear that you received the car in good condition. We are confident that it will serve you for a long period without any problem or fail. Thank you very much to you YUNUS and cardealpage you are such a good compuny. The track is just the way i expeted it's good and powerful. And i have made my brother and friends to buy from your compuny so who ever is worrid give him or her my number so that i can talk on your beharf thank you very much. Thank you very much for your e-mail and beautiful photo. It is always pleasure to do business with you. Let's keep our good relation and do more business together. Dear,I received the car attached to this is a picture of me and the car. Keep doing your good job. If you can re-take during the day time and send us again, we will be very much thankful to you. Otherwise, we are happy that you liked the condition of your bus. Thank you very much for your beautiful photo with your car and kids. I can see a happy family with a good car. Hope it will serve you for a long time. Please let me know if you need any other units in the future. Hi!I just want to inform you that I have received my car(toyota rav4)as shown in the picture.am realy happy because the car is in good condition! I will send you my family picture at the weekend! Thanks very much . Thank you very much for your kind feedback and attached photos. Please keep watching CardealPage for your future purchase and introduction to your friends. We will be happy to deal with you again. This is the photo of the 1st bus I bought from your company. It was a very good purchase and I am happy with it. After this bus I bought 3 more cars from you. Will keep doing business together. It is our pleasure to do business with you whenever you want. We are happy that our business relation is developing day by day. Will be waiting for photos with your other cars too. I cant begin to express my gratitude over your professionalism and efficiency with which you work. I received the car in perfect condition, and honestly, I cant wait to do business with you again. I will click on the feedback page, and send a photo of me and my family...in the car. Once again, receive my sincere gratitude, and all the love from my family and I. Your kind comments have brightened up our office! Thank you for letting us know, and we’re absolutely delighted that you’re so happy with our vehicle. We’re still a new company so we need all the support we can get. 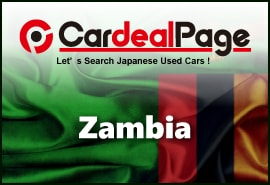 Dear Cardealpage team, greetings from Zambia. I am confirming that I got my car on saturday and I am very happy with the condition of the car. By and large, the car is running great as I drove it from point of Entry in Zambia for about 1000 km to Lusaka City where I stay. I have no complaint, just to say, thank you for being so honest with your communication. I have been refering people to your site and now they are happy to think about ordreing from you. Thank you very much for your message and good news. We are happy to hear that your car arrived in very good condition. Thank you for your photos with your dream car too. We look forward to do more and more business with you in the future. Thanks very much for your mail and sorry for late response I had gone to the farm to see my parents with my Bighorn. Once more thank you very much I received my vehicle and its in good condition. Attarched are the pictures with my Bighorn as per your request from your cardealpage team that I should get some pictures and send them over. Thank you very much for your e-mail and beautiful photos with your car. I am glad to hear that you received the car in excellent condition and happy with it. Hope to do more business with you and your friends in the future. I just want to inform you that the vehicle finally arrived home yestaday in good condtion, my wife confirmed. Am not in my country currently.Thankyou so much for the support.Good night. Thank you so much! Let me tell you, you and your beautiful wife look just GREAT! Thank you so much again Mr. Mukuni, you’re a STAR! Thank you very much for your concern. Yes I received the Motor and it is exactly what I ordered, its neat and the mileage is accurate. Thanks a lot for the accurate information regarding the vehicle and also for your excellent communication. I really appreciate and am looking forward to doing business with you soonest. Thank you very much for your good news. We are happy that you received your car safely and you liked the condition of it. Please take 1-2 photos with your car and send it to us. We are very hopeful to do more business with you in the future. My name is Samuel and my wife is Eneless. we live in Kabwe town in Zambia. We recently purchased a very good Toyota Allex car and it was in perfect condition. we are so happy for the services you provide and we wish to recommend other customers to buy from. Thank you very much for your warm words and beautiful photo with your dream car. We are very happy that you received it in good condition and enjoying driving it. I hope that all is well with you and the entire team at cardealpage. I just want to let you know that I received my vehicle on Tuesday the 2nd of April and it was safely delivered like you promised me. I also wish to let you know that I have someone who is interested in purchasing a canter light truck. Attached are the photos of me with the vehicle. Thank you very much for your beautiful photos with your dream car. I am very happy that you liked he condition of it. We hope it will serve you for a long tome without any fail or problem. I write to thank you for the car. It arrived at my home on Sunday 31st March,2014. I was doubting first but the support you gave me immediately you got the money and your kind and prompt responses to my emails built confidence in me. You really handled my case in a more professional way. I would have sent you pictures of the car and family but my digital camera got damaged and I need a USB cable if I have to use a phone.However, I will send the photos any day from now. I am sure the car will serve you for a long time and your family will enjoy it. Please let me know if your friends, colleagues or family members are looking for any car. I will be waiting for your photos with the car as early as possible. I am sure you will be happy with it for a long time. Please let me know if any of your friends or family members need our support. Thanks again Yunus for the car, it s in a perfect condition. I am telling others about you guys. Please maintain the high standards because I will be back for more soon. I am very happy to hear that you liked the car. Please enjoy driving your dream car. Let us know if you need any other unit from Japan. We will do our best for you again and again. Hope you are fine there. I recieved my car in perfect condition and i am now driving it around in Zambia with pride. As for this i would like to say thanks for dealing with you as it was a successful and honest deal. May you be blessed. We are confident that your dream car will serve at least 3-4 years without any problem. Please let us know if your friends or family members need good condition car from Japan. Please take 1-2 photos with your car and send me by e-mail. It will be your support to CardealPage. hope you are fine. I am well, too. Sorry I have gotten back to you late. I would like to show you the picture of my car which I bought from CardealPage. its a great car and doing very well! At the time I received it, it was extremely neat and all the accessories mentioned on the advert where on the vehicle and in perfect condition. I will recommend some of my friends to get their vehicles from your site! Thank you very much for your e-mail and photo with your dream car. I can see that your car is made just for you. Hope you will be happy with it for a long time. Please let me know if you need my assistance to your friends or family members in choosing correct car. Thank you very much for your positive opinion about the car. I am sure it will serve you for a long time without any problem. Please let us know if your friends or relatives are looking for any car. I however took note that the car battry was not ok upon arrival in Dareslaam, it couldnt start the car. However, My agent bought another new one which I have refunded him the money. I have no complaint, just to say, thank you for being so honest with your communication. I have been refering people to your site and now they are happy to think about ordreing from you. Please take 1-2 photos with your car and send us. P.S. The battery is not dead, just out of charge, if you charge it for 8-10 hours, it will work properly again. I received the vehicle and like it so much. It was a great pleasure to do business with you. Thank you very much for your photos, I really appreciate it. We are happy to hear that you liked the car. Hope to do more and more business in the future. I am very impressed with the service and the vehicle is in good condition just as I was seeing it on the internet. This is a picture of me with the vehicle. Thank you so much for taking time to send us your photo! We really appreciate the time you have taken to send us your photo as well as your comment. Please let us know if there is anything else we can do for you. We’d be delighted to help. God bless, and have a great drive! It gives me great pleasure to know that you have become another one of our highly-satisfied customers. Please let me know if you need any other vehicles from us. We will give you a fantastic deal with first-class service all over again! this company is the best in the car bussiness,i wish all people can be buying from them,their cars are very clean and very good condition.i love you the staffs keep up the good work. This is one of the best reviews we’ve ever had! Thank you so much, and we wish you all the best with your drive, purchased from none other than CardealPage. Thank you again! thanks very much really I appreciate your services your care for customers really bigup for your services I like it. Thank you very much for your appreciation letter and beautiful photo with your lovely car. Hope to do more and more business with you in the future. Thank you so much for your generous comments! We’re so happy to hear that you like your new Harrier that much! The Harrier looks great with you – have a great drive! I believe you are all doing very fine. As for me here all is well. I can now confirm that i received my car in good condition and will get back to you soon to purchase another car. Find the photos bellow for your references. My message to my fellow Zambians is " buy a car from Cardeal page" They have genuine cars. Thank you very much for your warm supportive words and beautiful photos. I really appreciate your time for it. We look forward to do more and more business with the people whom you know. I would to confirm that the vehicle you see above is under my ownership. Thank you team for the wonderful work you has been doing and should continue doing so. The business transaction I dealt with you is a class of its own, second to non that I know of. Every piece of detail in this transaction happened in a record time. Thumbs up to you all. And my special thanks to Yunus. As for Hillary my dear, you made my stay in Dar so easy that I regard it as my second home. In the picture am at my new plot where am building a house and Hillary helped me to buy electric cables from Dar. We are very happy to hear that you received your car in excellent condition and that you are enjoying driving it. Please keep in touch with us and we hope to support your friends with the purchase of good condition Japanese used cars too. Thank you very much for your photo! Sory for not informing you Earlier, I have received my Pajero io in a good condition acording to my expectation. Am realy praising&apreciating your good tearm of service. Thank you very much Mr. Yunus and your team. Attached are my photoes with my Pajero io. It was great pleasure to deal with you Sir. Hope you car will serve you without any fail or problem for a long time. Hi, sorry for taking long to respond, I was out in Nakonde to personally pick my vehicle. This is the third vehicle I have bought from you. This one too rides and feels very well just the earlier cars I have got from you. It's cleanness and excellence is only associated with brand new cars. I can't believe this one is a used car! Thank you very much for your e-mail and kind words. We are trying to improve our service and quality of our cars day by day. You can introduce us your friends and family members without any hesitation. Please send us photo with your 3rd beautiful car. Thank you Cardeal I recieved my car in a very pefect condition. Good and effective customer Service. We are confident that your car will serve for a long time without any fail or problem. Hope we will do business again and again in future. Its was really nice doing business with you people. the bus is still fit and intact. Hope to do more business with you people. I recommend your trustful company to everybody from my city and my country. We are happy to hear that your bus is in good shape and you are enjoying its service. Please do not hesitate to contact us again if you need any good condition item from Japan. We will do our best to serve you with pleasure. I feel I should register word of appreciation to for the motor vehicle I purchase from you people. I am a very happy person right now following the condition of I bought from. The car is very intact with all the gargets present. I must say thank you very much for the services and quick delivery of the car,I will encourage many of my friends to buy cars from you. Thank you very much for your e-mail and confirmation of arrival of your vehicle. We are very happy to hear that you liked your vehicle and enjoying driving it. We are confident that your vehicle will serve you with best performance for quite long time. As well as, we will be very happy to supply vehicles in best prices to your friends, family members and relatives when they also want to purchase directly from Japan. It is said that real friends are rare but among the rare ones, I have been so luck to find you people. The present you sent me has done a lot of talking among my family, friends, workmates and passers-by who are always asking about you. I feel free and proud recommending your website to them. They cannot go wrong at all. Indeed you have been honest, trustworthy and good business people to deal with. I have no regrets having done business online with CardealPage. Yunus, Meiko, Jun, and others, you are good. Keep up the spirit of true workmanship. Find attached photos for your office use. Thank you very much for your wonderful photos and sincere wishes. We are very happy to hear that you are enjoying driving your beautiful car. I am confident that it will serve you for 6-7 years without any problem or fail. We, CardealPage team wish you all the best on the roads. CardealPage will be waiting for your next order or orders from your family members, friends and relatives. Thank you very much for your message and kind confirmation. Please please do not forget to send us a beautiful photo wearing the T-shirt and standing next to your vehicle. It would be better if the sticker is also seen. First of all i would like to thank CardealPage, Ltd for good service you showed to me during the Car Deal before and after the transaction. If you need a good service, good communication and good english then deal with CardealPage. If you want your vehicle on time to your place then i can advise you to try this Company. Do you want someone to trust ? Then trust people at CardealPage. Look at how happy am people. Thank you for your feedback and the photo. We are really glad to see your beautiful car and you in the photo. I am glad to hear you are satisfied with our communication before and after you have received the car. Constant communication with our customer is very important to us and it is what I personally value much. Yes, we are confident to provide the same quality of services to other customers. I wish you a Merry Xmas and prosperous New Year. Attached hereto is picture which i took wearing the Cardeal Page T-shirt standing near my Pajero GDI which i purchased from your institution.I appreciate your excellent service and quality of your cars. Merry Xmas & A Happy New Year to you too!! Thank you very much for your feedback and the photo. We are so glad to see you and your Pajero in the photo. You look good with the T-shirt too. All we hope is that you will enjoy a great ride with your new car. It was our pleasure to provide the service to you this time. attached are photos of the Nissan Trail for Mildred Rumba of Zambia. Am very gratefull for the quick and caring customer service the relationship was thus far great,your timely update world-class to say the least. Well the car arrived on time and I would love to urge those that need to buy to check with CardealPage!!! Thank you so much for the photos. I can see she is very happy with her X-trail!! I'm sure she will have fun riding it. The constant communication with you was important for me. We all sales team keep in our minds that on-time communication with our customer is our duty. Thank you again for your great rating of our company. We will look forward to doing business any time with you again. It has been long since we talked. Hoping you are doing fine together with your colleagues. As for me here, things are okay and still appreciating the car you sold me. People admire this car so much that they are asking on how I got it and from who. I simply tell them to log on to either CardealPage or Cardealpage.com to get value for their money. In short I do advertise on your behalf and recommend you all the way. Yunus, I am always indebted to you dear. The car is doing very fine and making me realise what a good choice I made. Thanks brother and remain in touch. Be informed that I am now addicted to Cardealpage.com website since you sent me that leaflet together with car documents via DHL and I am reading about you and colleagues. Keep it up and continue with honest dealings. Pass my regards to all and may you have good health. Thank you for your feedback, brother. I am doing good and working hard to keep up communication with our customers. It is a great news for us to know you and people around you like your Pajero Jr.
Also, we are glad to know you enjoy our weekly magazine and updates. We will continue to inform you what we are doing. I was great to have done business with you. I will pass all regards to our team. I have received the truck. You are very kind.Please it be not last communication. Am advertising how you have done business me. So I think you prefer here in Zambia. Thank you very much for sending the photos. We are so glad to know you received your Canter safely in Zambia. It will not be the last communication between us as we provide our service when you visit us next time. It was very nice to do business with you this time. I am pleased to inform you that I have received the vehicle which I purchased from your company and am very pleased with the condition in which I received it in. Thanks for your great work, the personnel of cardealpage.com. Will be looking for more vehicles from your company. Kindly include me on your list of satisfied customers! Thank you for your feedback. Yes, you are definitely one of our best customers. We all hope your Challenger is serving you good under the African heat! Now we have more stocks of cars. We will wait for your next visit to our service. I am pleased to inform you that the BMW car I bought from your reputable company arrived in home-country Zambia in a very good condition as you sold it to me. I really appreciate for offering me such a good selection of a car which has been admired and appreciated by my family and friends. I will recommend any of my friends intending to vehicles from Japan to you. It is our delight that you like the quality of your BMW. To maintain the good quality of your BMW, you can take some of our articles in the column section of this webpage. You can find some precious nuggets for self maintenance of your car in those articles. We carefully select each car before we purchase and also have inspections to maintain the quality. Thank you for using our service!! This is to confirm that I received the truck. I am still observing its performance but so far so good. I want to thank you for your genuine business transactions. I am looking forward to doing some more business with you. I will also endeavor to introduce my friends to your company. Thank you very much for purchasing the Canter Guts from us. We hope the Canter will serve you long time as we choose each car carefully to be of a good quality. The transparency is very important to our service. We too are looking forward to doing a new business with you next time. Thanks very much for Rosa Bus i bought from your company. Am happy to tell you that the bus has good engine and everything about it is intact and i salute you for that. We are glad to hear that you are happy with your Rosa. We do our best to carefully make sure engine, interior and exterior conditions are good even before we purchase each car. Your satisfaction encourages us to sell more good quality cars to our customers. I received the Rosa bus and it is in exellent condition. Thank you so much for purchasing both Toyota Hilux Surf and Mitsubishi Rosa this time. We are satisfied when you as our customer are satisfied. So you are definitely one of our satisfied customers as you are happy with the cars! Recently my wife and i bought a vehicle-Toyota Harrier destined for Zambia for Mrs L.T-Kalunga Refference NO. was 1128 of Mansa Town. we are so greatful to you and Cardeal Page because the car is smart and in very good condition, we hope to deal more business with you. We hope you like the Harrier very much. Harrier is one of the most popular vehicles on CardealPage. Delivering a car of good quality is what we value a lot in our company. We hope to provide more service to you Mr. Joseph for near future too. Many thanks for using our service this time. Thank you very much for the feedback. I imagine your passengers can have a happy ride with your big simile every day. 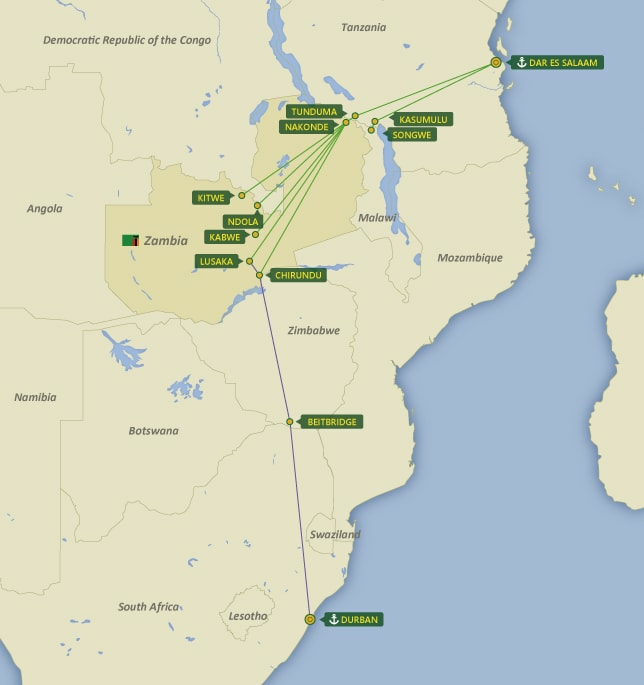 We sell many buses to Zambia and so glad to know those buses are serving many people there. Because we want drivers and passengers to enjoy a ride, we care for the quality of cars we sell. We hope you have a great and safe ride with your big smile today! CardealPage can now accept payments not just via banks, but also via ZAMPOST! You can search through CardealPage vehicles from computers at ZAMPOST branches. Our partnership with ZAMPOST makes your payment quick, convenient, and secure! Pay at your local branch! Fund transfer is quicker via ZAMPOST than bank. Make sure the vehicle is yours! Choose from 5,000 units in stock! 5.Instant transfer! ZAMPOST fund transfer is quicker than bank! NOTE: You must be a Zambian customer to take advantage of ZAMPOST payment. Payment Assurance Fee is payable for ZAMPOST service. Delivery to NAKONDE, LUSAKA, CHIRUNDU, KABWE, NDOLA, SAKANIA, MOKAMBO, KITWE & KASUMBALESA via DAR ES SALAAM are included Customs Clearance Fee. In case of delivery to CHIRUNDU via DURBAN, we recommend to pay Customs Clearance Fee and Import Duty before receiving your vehicle.Vehicle will be delivered to the specified location. In case of delivery to LUSAKA via DURBAN, Customs Clearance Fee & Import Duty must be paid before entering Zambia border. If you are looking for garage in Lusaka Zambia. We recommend BALDYS MECHANICAL SERVICES LIMITED as a reliable company. They are supplying high-quality services. Other restrictions : Right Hand Drive (exceptions for specialized vehicles e.g. ambulances and fire engines). "The Post" is the leading, and one of the most respected newspapers in Zambia. We advertise here once a week. "Zambian Auto News" is a Zambian newspapers specializing in automotives. We advertise here twice a month.